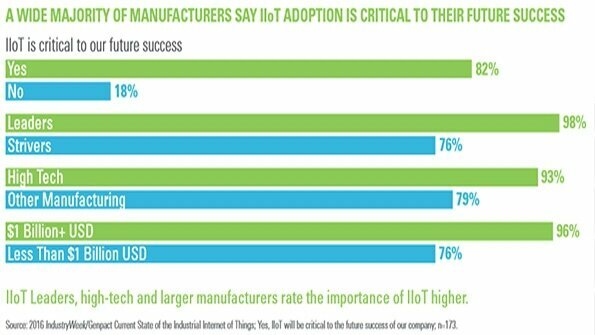 Far more manufacturing executives than not think that the Industrial Internet of Things will provide the path to future success. Far fewer have a good idea of how to get there. Those are just two of the numerous findings from “Transforming Industrial Businesses with the Internet of Things”, a new research study from the Genpact Research Institute and IndustryWeek, in conjunction with GE Digital and the Industrial Internet Consortium. 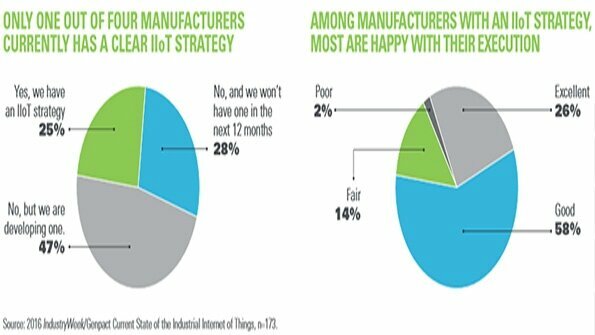 Stick around for the next 11 slides and glean more numbers and facts about the current adoption levels, numerous challenges and potential future of the IIoT, according to 173 manufacturing decision makers from around the globe. 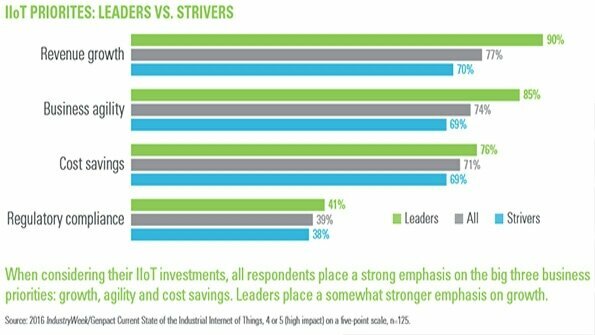 When the conversation turns to the IIoT, there are leaders and there are followers — or, in this survey, strivers. 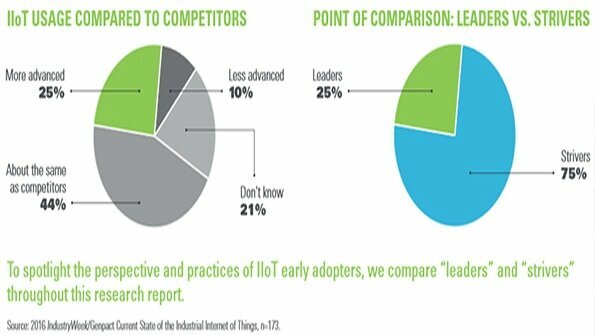 Among the 173 respondents, about a quarter figure their IIoT adoption and implementation were more advanced than their competitors. As illustrated in the chart on the left, though, not many respondents think they trail. 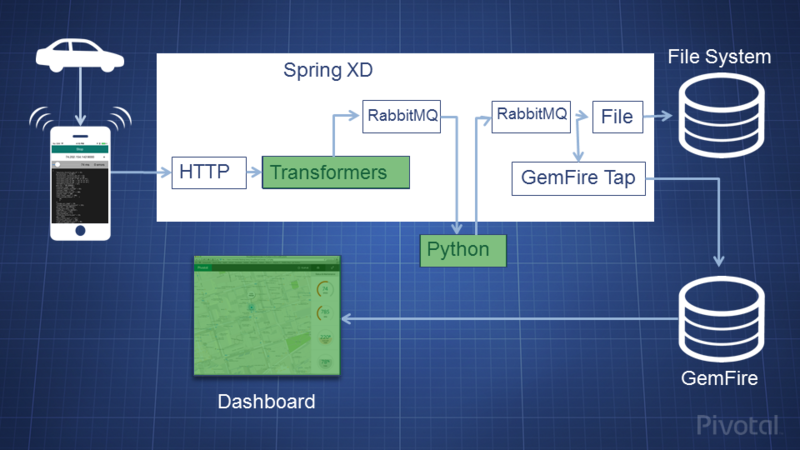 No one company will win this IIoT game, if you even want to call it a game, or even address challenges and problems without tremendous collaboration. Those manufacturing leaders are currently investing in new tech, upgrading their infrastructure, and training current workers and hiring new ones. The top goals — for leaders and strivers, alike — are revenue growth, business agility and cost savings. 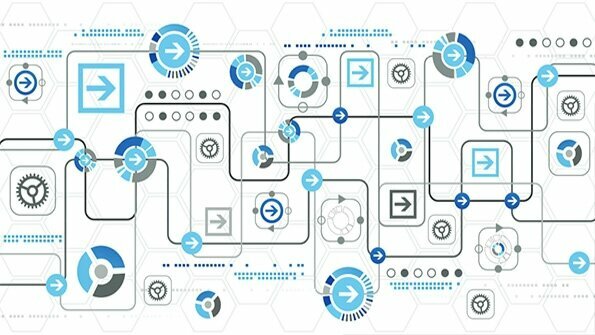 Will you really need IIoT? 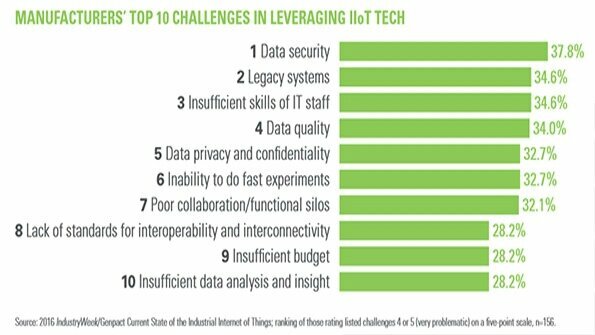 … however, only one of every four (25%) said their company currently has an IIoT strategy, while 47% said their company is currently developing one. The other 28% said their company has no plans to develop one in the next year. As for those that have developed and implemented a plan, 98% said their execution was excellent (26%), good (58%) or fair (14%). Just 2% said it was poor. 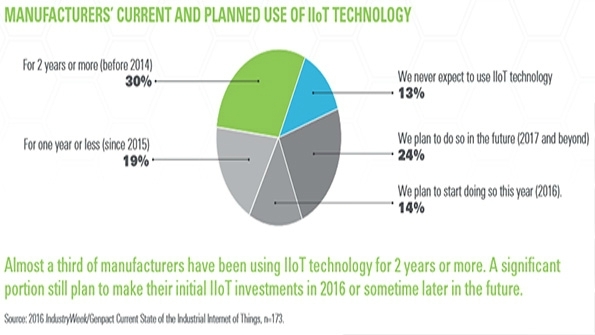 As with any technology, mainstream adopters need clear ROI examples from their peers and competitors, but with fewer companies fully implementing the IIoT, most of the more practical applications have yet to be developed. Turn to Joseph Heller and call it a catch-22. By the numbers, 30% of respondents have used the tech since 2013 or earlier and another 19% since 2015 or earlier, with another 38% planning to start by next year. The other 13%? They never expect to use it. 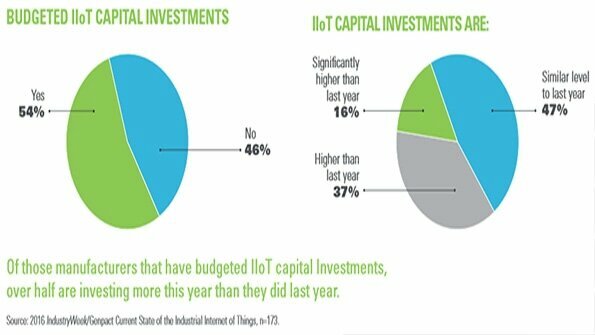 More than half of all respondents (54%) said their company has included IIoT capital investments in the budget, with the overwhelming majority (84%) spending at least as much if not more than last year. Data breaches are already in the news regularly, and without effective defense, they could rise right along with the sheer number of connected devices. 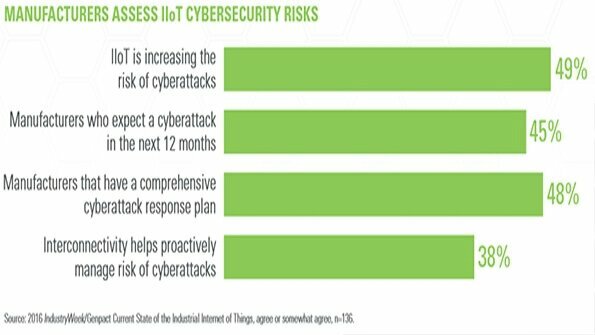 Nearly half of all respondents said that the IIoT is increasing the risk of cyeberattack (48%), that they expect to face an attack in the next year (45%), and that they have a comprehensive plan to counter that attack (48%). That last number is encouraging … until you realize that it also means more than half have don’t have a comprehensive plan. Data security, privacy and quality are the top three challenges cited by leaders, who also are more likely to expect a cyberattack in the next year and have a defense plan. Strivers, meanwhile, are dealing with legacy system challenges, insufficient IT staff skills and an inability to experiment with new tech. 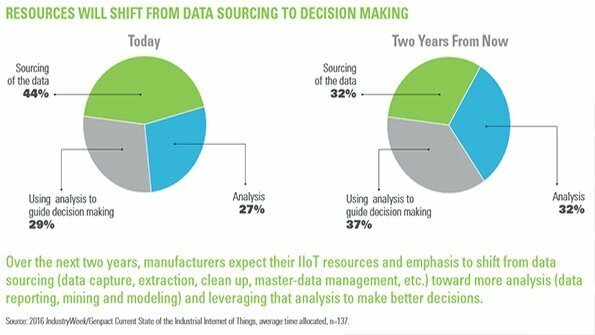 Today, close to half of all respondents (44%) said their IIoT resources go to data sourcing — capture, extraction, management, etc. By 2018, however, almost three-quarters (69%) expect those resources to be poured into analysis to improve decision-making, using that data to better run the company. Where will IIoT make a difference? 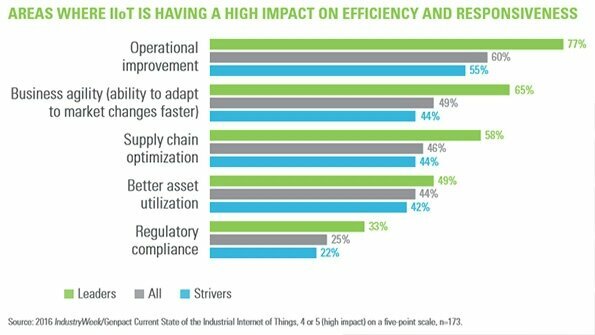 The IIoT is already affecting operational improvement, especially among leaders (77%). Regulatory compliance isn’t as affected yet (25% overall), perhaps because of some of the unresolved challenges around tracking data provenance and lineage. And where will it affect growth? 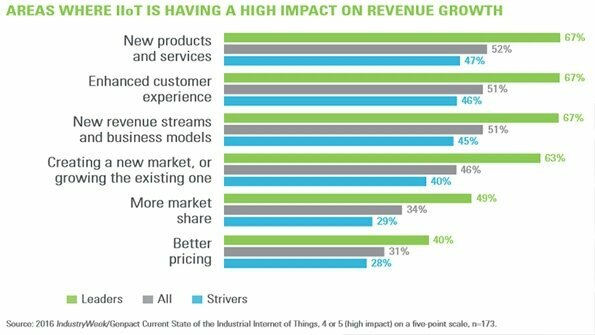 Right now, manufacturers are leveraging the IIoT, almost equally, to create new products and services (67% among leaders, 52% overall), enhance customer service (67%, 51%), create new revenue streams (67%, 51%), and open new markets or grow existing ones (63%, 46%). Now, check back in a year or two, of course, and these numbers and growth areas could look significantly different.